Preliminary Report: Ethiopian Airlines Flight Repeatedly Nose-Dived Before Crash Boeing CEO Dennis Muilenburg acknowledged that there was a software error in this and in an earlier deadly crash of the 737 Max aircraft and said the company knows how to "eliminate the risk." 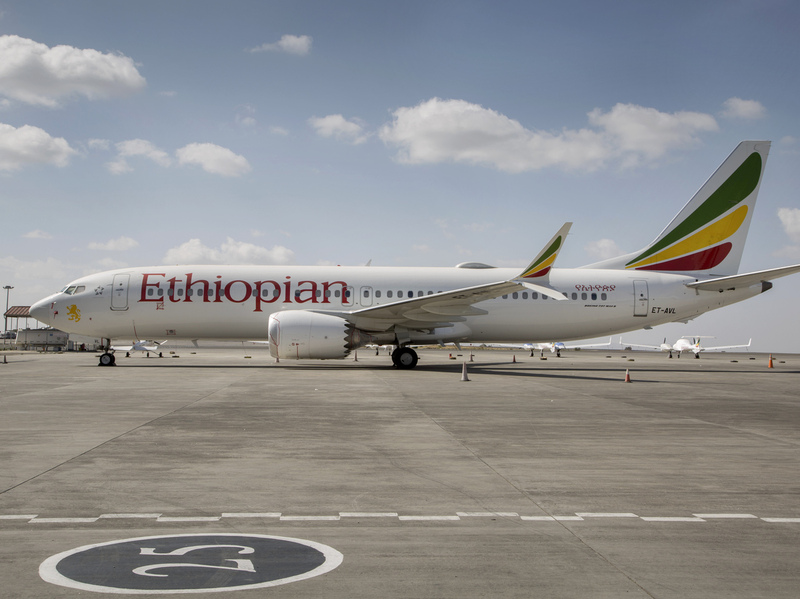 An Ethiopian Airlines Boeing 737 Max 8 sits grounded in Addis Ababa, Ethiopia, in March. Ethiopian officials on Thursday released the initial report into last month's crash of a Max 8. The crew of Ethiopian Airlines Flight 302 followed procedures from Boeing but could not stop the plane from repeatedly nose-diving and ultimately crashing last month, killing all 157 people on board, Ethiopian officials said Thursday. Presenting the preliminary report into the crash, Ethiopian Transport Minister Dagmawit Moges told reporters in Addis Ababa that "the crew performed all the procedures repeatedly provided by the manufacturer but was not able to control the aircraft." Hours later, Boeing Company CEO Dennis Muilenburg conceded that it was a software error that caused the 737 Max jets to crash, but he noted that most aviation accidents are "caused by a chain of events." "With the release of the preliminary report of the Ethiopian Airlines Flight 302 accident investigation, it's apparent that in both flights the Maneuvering Characteristics Augmentation System, known as MCAS, activated in response to erroneous angle of attack information," he said in a statement. "It's our responsibility to eliminate this risk. We own it and we know how to do it," he added. The preliminary report by Ethiopian officials said they could not yet determine whether there was a structural problem with the aircraft, based on data retrieved from the flight data recorder and cockpit voice recorder. Moges said the Boeing 737 Max 8 had a valid certificate of airworthiness, the crew had necessary qualifications and takeoff appeared to be normal. "Since repetitive uncommanded aircraft nose down conditions are noticed ... it is recommend that the aircraft control system shall be reviewed by the manufacturer," Moges said. "Despite [the pilots'] hard work and full compliance with the emergency procedures, it was very unfortunate that they could not recover the airplane from the persistence (of) nose diving," Ethiopian Airlines wrote in a statement on Thursday. Boeing said it will "carefully review" the investigation's findings. "I'd like to reiterate our deepest sympathies are with the families and loved ones of those who lost their lives in the accident," Boeing Commercial Airplanes President and CEO Kevin McAllister said in an emailed statement. "We thank Ethiopia's Accident Investigation Bureau for its hard work and continuing efforts. Understanding the circumstances that contributed to this accident is critical to ensuring safe flight." Officials said "additional documents" gathered from the operator and aviation authorities, as well as remnants collected at the accident site, were also used in the preliminary report's conclusion. The full report into the crash will be released within a year, Moges said. She added that an international team investigating the crash includes the National Transportation Safety Board and the Federal Aviation Administration in the U.S., France's BEA and the European Union Aviation Safety Agency. The Ethiopian Airlines jet crashed minutes after takeoff from Addis Ababa on March 10, just months after an earlier crash of a Lion Air jet in Indonesia of the same model plane. Ethiopian officials had previously said readings from black box data showed "clear" similarities between the two flights. As NPR's Russell Lewis has reported, the similarities involve an anti-stall system on both jets, the MCAS, designed to push the nose of the plane down if flight control systems sense a problem with low air speed. Both the planes appeared to ascend and descend erratically, suggesting the pilots struggled to maintain control. The two crashes killed a combined 346 people and led to Max 8 being grounded in dozens of countries across the world, including the United States. Boeing continues to work on a software fix for its flight control systems, which was initially slated to be submitted to the FAA last week. But the FAA said in a statement on Monday that it now expects Boeing's submission in the coming weeks. "Time is needed for additional work by Boeing as the result of an ongoing review of the 737 MAX Flight Control System to ensure that Boeing has identified and appropriately addressed all pertinent issues," the FAA wrote. In Boeing's statement, the company did not indicate when the update will be released but said that it "adds additional layers of protection and will prevent erroneous data from causing MCAS activation." Daniel Elwell, acting head of the FAA, in testimony before a Senate committee last week, defended the agency's decision to ground the plane days after most other countries had already done so, as well as the FAA's process for reviewing changes to plane design. "The FAA is directly involved in the testing and certification of new and novel features and technologies," he said in his opening remarks. Last month, The Seattle Times reported that an analysis Boeing delivered to the Federal Aviation Administration regarding the safety of MCAS "had several crucial flaws." Anonymous sources inside the FAA told the Times that the agency inappropriately delegated the airplane's certification to Boeing employees. Boeing told the Times there were "significant mischaracterizations" in its description of flaws in the analysis.